Since TEPCO, which is central within FEPCO, is currently under government control, METI probably wants to seize the opportunity to advance its long-held aspirations for complete liberalization. Because TEPCO will inevitably be selling its power plants during the bankruptcy process, such sales to new entrants could promote competition as well. But the actual infrastructure is not as important as whether genuine competition ensues with liberalization. As background material to what challenges may arise in liberalization of electric power, the following reflects concisely on the liberalization of telecommunications advanced during the 1980s. The 1982 settlement concerning the break-up of AT&T marked the global beginnings of liberalization for telecommunications. An independent telecommunications operator filed suit over AT&T’s refusal to provide connections, and the Department of Justice subsequently indicted AT&T for violating anti-trust laws. The settlement determined that local exchange service would be split into seven regional telephone companies. The split-up of the equity took place in 1984, and AT&T was left with just its long-distance service and computer business. BT (British Telecom) was also privatized in 1984. In Japan, the Second Provisional Administrative Investigation Council was established in 1981. 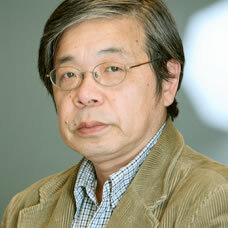 Toshio Doko assumed the chairmanship for administrative government reform under the motto “Fiscal reconstruction without tax increases.” The third report of the Council in 1982 recommended the breakup and privatization of Japan National Railways (JNR), as well as the breakup and privatization of NTT Public Corp. Free economy reforms set forth in the 1980s by Reagan and Thatcher had an impact to these recommendations, but the Liberal Democratic Party and business community were also feeling threatened by the growing aggressiveness of the labor unions typified by strikes over the right to strike. In addition to these circumstances, the cumulative JNR debt had reached 37 trillion yen at its peak, and was putting pressure on fiscal policy. Yasuhiro Nakasone became prime minister in 1982, and advanced government reforms accordingly. The largest target was JNR, which was split up and privatized in accordance with the Council. The National Rail Workers Union (NRWU), holding a central position in the public employee unions’ federation, was dismantled. Unlike the JNR case, privatization of NTT Public Corp. faced less opposition, because the telecom business was expanding in operations. The large-scale accounting fraud case that came out toward the end of NTT’s public ownership caused Hisashi Shinto from the financial world to be appointed president, who worked in alliance with the government to promote privatization. But management and labor opposed the split-up, and opinion in the business community was also divided. The Ministry of Posts and Telecommunications (MPT) asserted the AT&T method for a complete breakup, but the Keidanren (or Japan Business Federation) also contained strong sentiment that considered a breakup undesirable from the perspective of international competitiveness. Instead of putting up a bitter fight to the end, the Japan Telecommunications Workers Union avoided the same fate as the NRWU by accepting privatization that avoided a breakup. In the end, the NTT Law in 1984 decided by the Cabinet deferred a regional breakup, and the accounting between local call service and long-distance service was separated. Since entrants to the highly profitable long-distance telephone service were expected, interconnections to subscriber lines, which would be the bottleneck to enable business, were mandated along with connection tariffs for the local network. But the local network and long-distance network were integrated at NTT, and left a lack of transparency over the calculation of connection charges. The debate over fairness in these charges emerged repeatedly after the privatization. Unlike the breakup of AT&T in the U.S. sparked by a business challenging the situation and committed by a judicial process, the liberalization of telecommunications in Japan was an intervention set forth by the LDP and business community. The aim was to enable private enterprise to gain an interest in the telecommunications franchise, and to trim the political power of the labor unions. These clear purposes aligned politicians, government officials, and business leaders to strategic reforms. 2. What is the Purpose of Electric Power Liberalization? In contrast, the liberalization of electric power began as a MITI initiative in 1995, in response to energy cost cuts sought across the business sector. But strong opposition by the power companies, who maintained a central role in the business community, scuttled the effort in the final phase. The situation is starkly different from the scenario of conflict between NTT Public Corp. and the business community, and one reason why reform is not progressing with electric power. Liberalization is not a clear path to lower electricity rates for users. The electricity directive of 1996 made liberalization a fact for the EU, but even in the U.K. where competition is the most advanced, rates have not declined appreciably compared to before liberalization as seen in the Figure. Competition in Germany resulted in eight large power companies merging into four, although France continues with a monopoly. The decrease in electricity pricing has actually continued at a constant rate since prior to liberalization, with essentially no relation to the level of liberalization. 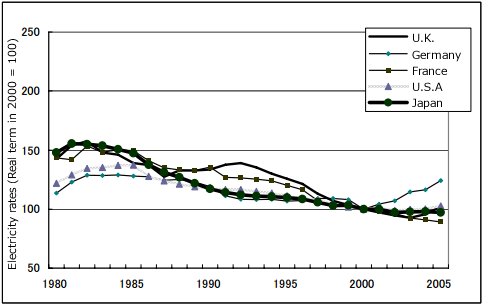 The change in energy prices appears to have a larger influence (Yamaguchi, 2007). The question is whether competition occurs as a result of liberalization. Even for business with large customers, where liberalization is already in place, the share of new power providers aside from the 10 power companies remains at 3.5%. The likelihood of entrants to supply small customers with a much larger cost base is questionable. One key reason is the delivery charge when using the transmission grid of a power company. For high-voltage power, the charge costs 4.89 yen/kWh. Since the national average tariff for large customers across the power companies is 13.65 yen, the delivery charge costs 36% of the tariff. But the biggest reason concerns the advantage in economy of scale, since the electric power business has large fixed costs in infrastructure investment (particularly the transmission grid). The power companies transmit power to many businesses, and therefore, the unit cost can be inexpensive. But offering a lower tariff than the power company is difficult for new power companies with few customers. Most new power providers are a sideline of massive steel or gas corporations exploiting the heat generated within their own plant facilities. In contrast, the electricity rates for small accounts work off of a fully distributed cost model, so profits are assured. The electric power sold within the regulated segment of TEPCO (chiefly small accounts) constitutes 38% of the total, but reaps 91% of the operating income. Liberalization of electricity for small accounts, however, will not simply lower residential rates through an increase of new entrants to the industry. There are 17 million households using electricity within the service area of TEPCO, whose grid investment is in trillions of yen. Only a handful of companies exist that can finance such a huge sum and own the infrastructure technology. In this context, the smart meter tender planned for this fall by TEPCO is important. The existing, proprietary TEPCO standard would make the entry of new power providers to serve small accounts virtually impossible. Instead, an open standard could allow telecom companies to also participate through international standards applied to each module, and bring about possibilities of innovation through convergence of data and energy (Society for Smart Meter Study, 2012). The largest issue concerns not whether to liberalize or not, but whether new companies will venture into the industry. The privatization of NTT Public Corp. in 1985 and contemporaneous legislation of the Telecommunications Business Law brought forth liberalization of telecommunications, but the lingering concern was whether any competitors would emerge. Owning a proprietary communications network and carrying a heavily excessive head count, JNR established Japan Telecom, and the Public Highway Corporation with its fiberoptic easement ducts alongside the expressways established Teleway Japan Corp. Both businesses were quasi-public, and doubtful in terms of capably competing with NTT. So the entire business community got involved in establishing DDI. Kazuo Inamori of Kyocera took a central role, and twenty-five companies invested, including Secom, Sony, and Mitsubishi. Many engineers, as well as Sachio Senmoto, who became a senior managing director, transferred in from NTT. NTT president Shinto leased out to DDI one route among the microwave circuits owned by NTT between Tokyo, Nagoya, and Osaka. Strong dissent was voiced internally at NTT over this, but Shinto wanted to rationalize the company by promoting competition. In the end, the surviving competition was neither Japan Telecom nor Teleway Japan that held infrastructure, but DDI, which held neither technology nor infrastructure. Entrepreneurial spirit is important, not technology. Strong criticism has been leveled at this type of “managed” competition, which allegedly distorted the market and steered profits to selected companies. But left solely to market dynamics, competition in this industry probably would not have occurred. This matter is even more difficult with electric power. Revenues of NTT Public Corp. at the time of privatization were about 5 trillion yen, about the same as TEPCO today. But that figure is 15 trillion yen now for all 10 power companies combined. With an allowance for inflation, the industry would be 1.5 times greater than the telephone company. Introducing competition will require an extremely strong force. The energy industry, incidentally, holds innovative potential by linking to information and communication technologies. Japanese businesses may find it difficult to chase after ultra-quick innovations by Apple or Google, but high reliability and quality of service for infrastructure industries like energy can deliver competitive superiority. Technological superiority of Japan, in fact, is significant in the energy domain. Japanese businesses have opportunities for wins here, since linking technologies are not strongly defined with information and communications—if international standards that avoid leanings toward “made for Japan” technologies are pursued. The AT&T breakup was structured as a complete equity dissociation of the regional operators (RBOCs), while BT was privatized as one piece. NTT attempted to secure fair competition by regulating interconnections like the BT model, but calls for a full breakup remained strong, as originally provided in the report of the Administrative Investigation Council. The Telecommunications Council reviewed the business structure again in 1992, and the wireless business was spun off as NTT Mobile Communications (now NTT DoCoMo) in 1993. A compromise to the breakup versus consolidation was finally settled in 1997 with the adoption of a holding company organization. Commercial Law prohibited pure holding companies at the time, but a super-legislative measure was adopted for NTT to become a pure holding company with the premise that Commercial Law would be amended in 1998. This device looked like a perfect compromise at the time, but the result was a failure. The Administrative Investigation Council envisioned a separation between local networks and long-distance networks. The mainstream network, however, was already the Internet, which made no distinction between local and long distance. The networks were chopped up by prefecture, sales activities across prefectures were prohibited, and NTT’s network became quite inefficient. Subdividing infrastructure in this way has advantages and disadvantages. When technology advances rapidly like in the telecommunications realm, there is a risk that innovation can be stifled by fixing structures of that moment in time. This risk is small when technologies are mature, such as for electric power, although quality of electricity may pose a problem. The failure of separation between power generation and transmission in the 2000s resulted from FEPCO propagating that splitting up the industry would prevent reliable delivery—after seeing the major power disruptions in California at the time. The power outages of California were not caused by liberalization, but a failure in regulations, which liberalized wholesale but retained the regulated retail tariffs (Asano & Yajima, 2004). Nonetheless, carving up the infrastructure of the power companies today, where power generation is controlled through the transmission grid, will undoubtedly decrease the reliability of delivery. METI, therefore, is supposedly eyeing a functional separation where third parties (independent service operators or ISOs) can operate over the infrastructure that remains owned by the power companies, rather than a complete separation. Under this scenario, if new companies enter into power generation and efficiency rises, benefits outweighing the costs of supply instability should follow. Another possibility is the emergence of independent businesses exploiting DR (demand response) to manage demand. At this point, these businesses are essentially non-existent in Japan, because connecting to the power grid requires permission of the power companies. An ISO for the transmission system will probably increase freedoms, and modularized technologies make environmental responsiveness flexible. Safety of nuclear power plants can be improved, and innovation can be expected (Aoki-Rothwell, 2011). Liberalization of electric power was essentially completed during the 1990s in the U.S. and Europe, but Japan still needs to finish its homework. Complete liberalization is a standing policy. The separation of function between transmission and power generation should not impair the stability of supply to any extent. Breaking up the companies, however, represents the most powerful policy for competition and also faces strong opposition from the power companies themselves. Large outages occurred in the U.S. amidst liberalization efforts in the past, and at that time FEPCO used political forces of the LDP to beat back MITI’s intent. Today, however, the Nuclear Damage Liability Facilitation Fund owns the majority of TEPCO stock, which means that a breakup or sale of the company is legally possible. Aside from TEPCO, however, the other power companies command the regional business communities, and are unlikely to compromise with the DPJ government whose viability is tenuous. It remains doubtful whether politics can evince leadership against an opposing position that claims the world’s highest quality of electric power to be in Japan today with rates that are not too expensive. The non-substantive “de-nuclearization” issue complicates matters, and is confusing the liberalization debate as well. In any event, the entry of new companies to the industry is important, and there is no need to limit that to domestic businesses. The growth outlook of the Asian markets suggests that liberalization might be advanced with Asia in mind from the beginning. Long-term government strategy is needed to make the nuclear power plant accident a lesson that brings about positive change.